More New Living Room Paint - Third Time's a Charm? More New Living Room Paint- Third Times A Charm! We had the living room painted. I know y’all think I’m crazy. But at least now I’m happy and crazy! We started out with the dark beige color from the previous owners. There was nothing wrong with this color, it was just very dark, and very beige. Then I made the mistake of going with an almost-white / light beige color (Benjamin Moore Sailcloth). In my head, I wanted to try to pull off the gorgeous white rooms I see all over Pinterest these days. In reality, it looked like a house from the 80’s that had never been updated. Don’t get me wrong– I think that white walls are great for small cottages and bungalows that need the rooms to look larger, and it’s great for cavernous rooms that have layers upon layers of moldings and trim. But in big cavernous rooms with nothing but sheetrook and a little bit of trim, I have found that you need some color to pull it off. 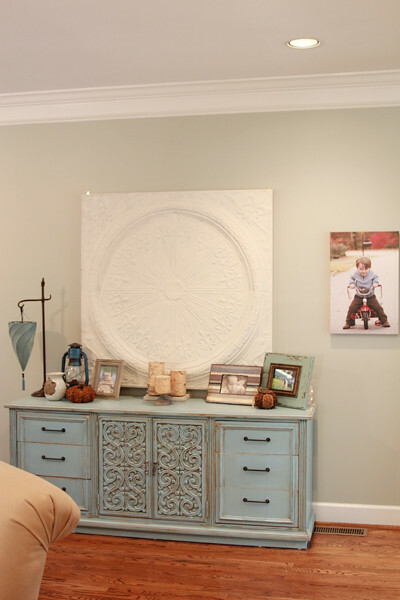 This is using Restoration Hardware Silver Sage color matched by Sherwin Williams in a satin finish. 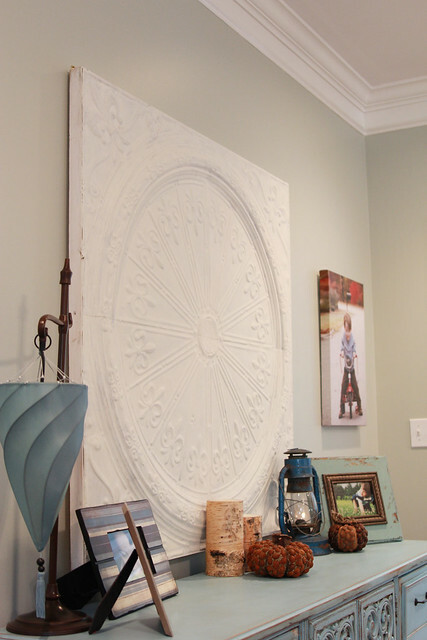 I loved it so much in my kitchen that I carried it right on into the living room, foyer and balcony. I am much happier with this new paint color. Even though it’s still a light and airy color, it’s really warmed up the room in comparison to the Sailcloth. It’s not as cold and stark in here anymore, which I love. And after with RH Silver Sage. So now it’s time for me to get some stuff on the walls in the staircase. I cannot decide what to put there so I just haven’t put anything because I’m lazy like that.. Another reason I keep putting it off is because in July I ordered two giant Organic Bloom looking photo frames but they have yet to arrive. After multiple emails to the seller I still don’t have a confirmation date on when they will get here. I’m thinking of cancelling my order and trying to DIY these Organic Bloom frame knockoffs. 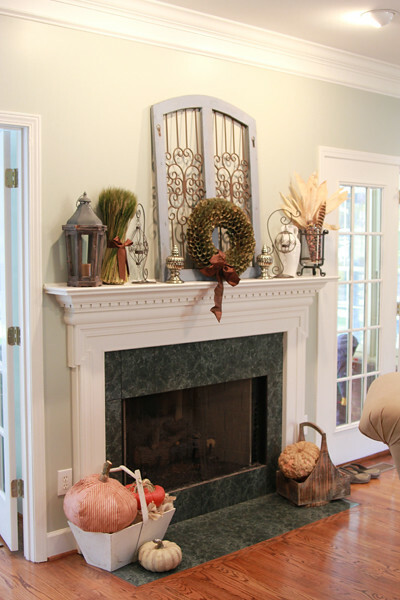 Now that we have a paint that I’m happy with the fireplace surround is next on my list of things to change in this room. While I’d really love a big stone fireplace and a rustic mantel, I’m not sure how long it will be before I pull the trigger on that. Somehow, that faux green marble is going to go. The wall that opens onto the kitchen and dining room is also where the tv armoire sits, so this is the view that gets stared at the most by my family. 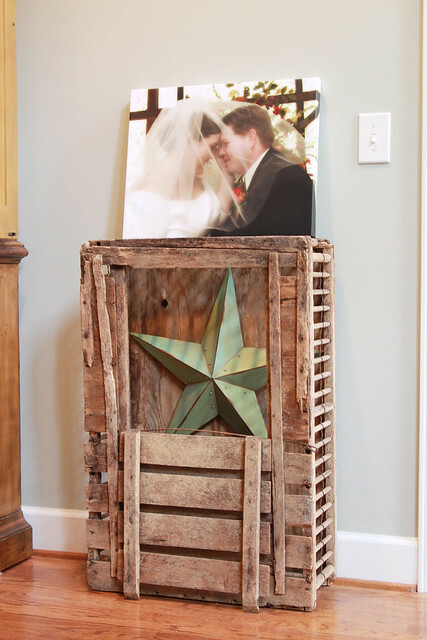 I finally figured out what to do with that chicken crate that I scored over the summer! I’m 1000% happier with the way my tin tile looks against this paint color. It was so washed out against the other color that you almost couldn’t see it. Now the paint gives it a nice subtle backdrop that I really like. The Nadeau bookshelf really stands out great on this wall. I love the way it looks against the new paint. So there you go! It’s done! The fact that I’m dedicating an entire blog entry to it should tell you that I’m extremely happy with this third coat of paint. I didn’t even bother blogging about the Sailcloth color because I was not that into it. But finally I can say that the paint is done and I am happy! It’s a good thing, too, since I probably won’t be redoing again until I’m 60ish. « ABC, easy as 123. Yay! It looks great! Amazing how different the color looks in different lights. I’ve been known to change colors too. It looks beautiful. I really like this color. I might put in my bedroom choice list. 2. I want that chicken crate for my chickens! Love, love, LOVE it!! I’m so glad you found a color that you like! You may have helped me to NOT make a terrible mistake! I have been wanting to paint our walls a darker color. 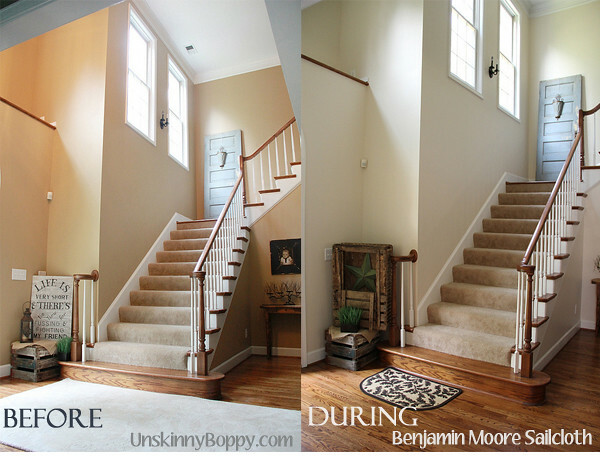 When I see the difference between the color that your walls were originally and the color you’ve painted them now, I can tell that the lighter color is BETTER. Funny too, I think the current color on our walls is very similar to your current shade. Beautiful! I love your home. Trust me, you’re not alone in the repainting department. 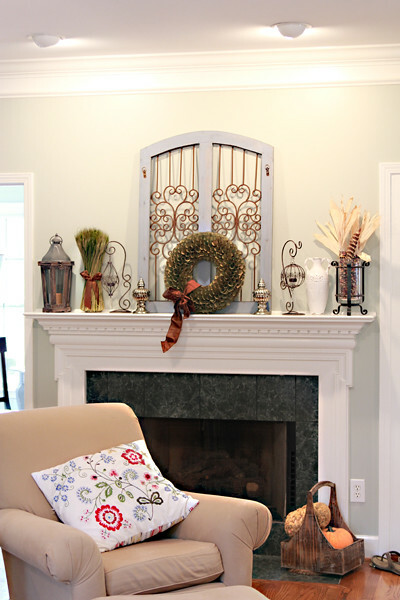 I’m already wanting to change paint the paint in 2 rooms that I just finished a few months ago! I absolutely love your living room, and I don’t just throw comments like that around. Gorgeous! Girl, I struggle with color too, it can be so hard. The silver sage is just stunning, you made the right choice and it really brightens up your whole home. 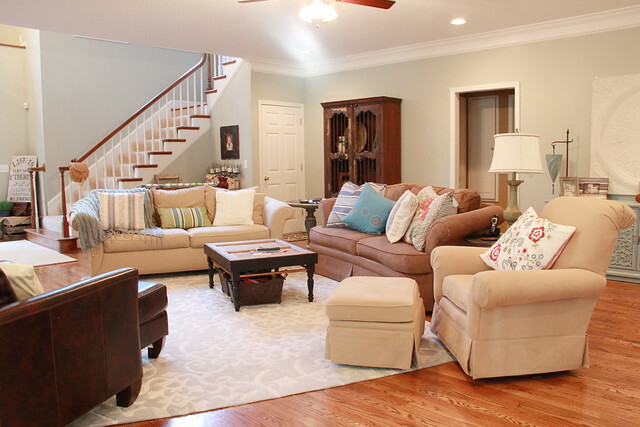 I realized while trying to find a new paint color for the bulk of the home that we too could not pull off the paint I was dreaming about, it just didn’t flow. 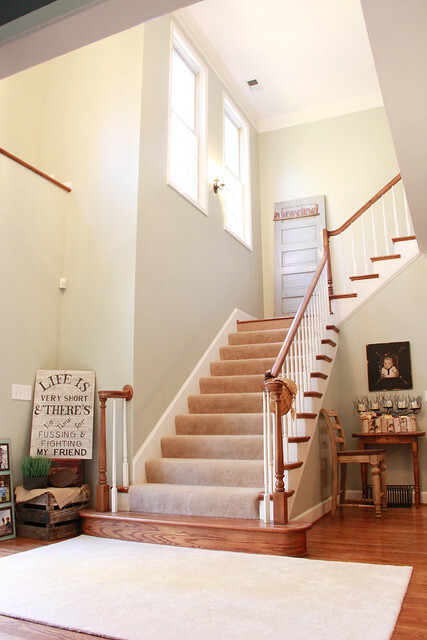 But the bleeker beige worked perfect with a little bit of grey but warm enough to work in the open floor plan. So I love the carpet a ton! Where did you buy it? I know differen’t stores sell them at differen’t prices. 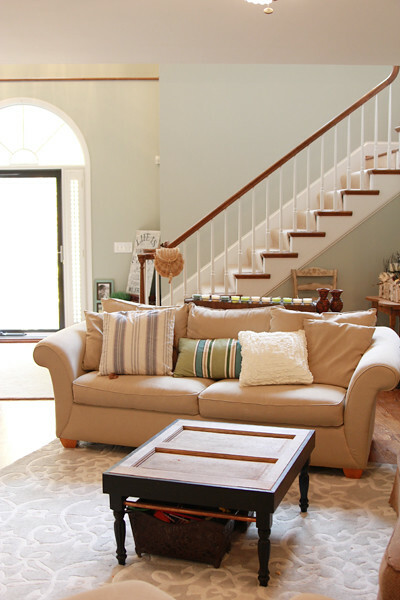 Thanks for your link it, love seeing the rug in a home! Thank you for sharing. You made an excellent choice. The silver sage is an excellent complementary color for the woods and your furniture. Now I am leaning towards doing a SW mix of it (totally surprised at the priciness of the RH paint…I don’t know why?). Your search for the paint you want reminds me of a quote, “Never settle for anything less than what you truly want.” Indeed! 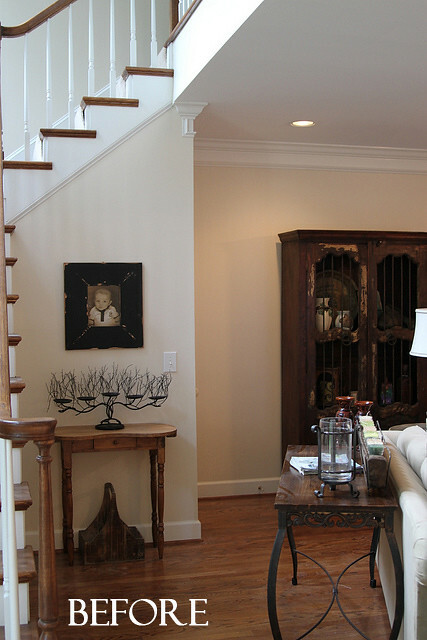 In fact, in feng shui, the hue you chose represents wood – it means creativity and growth. Also, the paint of our rooms greatly affect our everyday mood. It’s good that you’re contented with the paint you chose. Love your home! 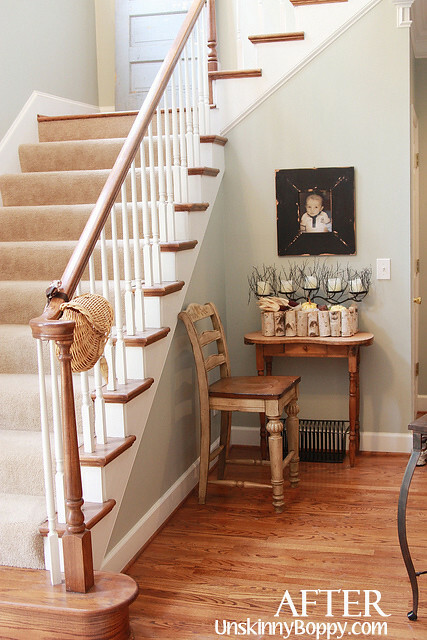 You have inspired me to paint my entryway, family room and kitchen silver sage. I also want to get it matched at SW. What paint finish did you use (satin, flat)? Did you use the same finish for all of your rooms? Also do your have the color match code from your cans? I want to make sure our SW gets it right! Love the color is that rh silver sage, the acctually silver sage or is that the pale sivler in the silver sage line? I LOVE the new color! I’ve been trying to match Silver Sage at several paint counters for weeks, but none of them have been successful. Do you happen to have the formula on the can to share? Please and thank you! Hi, I love the color of this room! Can you tell me how accurate the photo color is to the color in actuality? I am looking for a soft subtle green with a hint of blue in it, and am having the hardest time. Also I heard that Silver Sage from RH is the same as Benjamin Moore Silver Sage, do you know if this is true? Hi Beth! First of all, I just want to say what a gorgeous home you have! You have some serious talent with decorating! I am dying to know where you got the rug? It’s perfect!